"Called to holiness, we dedicate ourselves to the ongoing mission of Christ, through the celebration of the sacraments, evangelization, and service to others." and before Saturday 5:00pm Mass. "Christ our Passover has been sacrificed; let us celebrate the feast then, in the Lord." The Resurrection of the Lord is the highest of all feasts - the day in which we celebrate the truth that Jesus conquers and redeems every darkness of life, even death itself. Truly this is a day of rejoicing! For even when events are unclear to us - when we do not understand what we see before us, like those who saw the empty tomb - we can be confident in the words and promises of God. Tuesday - 10:00 am Mass at Yucalta for +Ed Theberge Jr. offered by Ed Theberge Sr.
Easter Message from Bishop Gary - To watch the message please click HERE. I want to extend my heartfelt gratitude to each and every one of you for all your service to our parish during Lent and Holy Week. May you all receive God’s promise of hope and salvation. I wish you and your loved ones a Happy Easter filled with faith, peace and love. The Easter Vigil : During the course of the Easter Vigil Celebration the parish welcomed three new Catholics as parishioners. The three, Brook, Kylie and David had followed and completed the RCIA offered by the parish. They were baptised, confirmed and received the Holy Eucharist during the Mass. Afterwards there was a reception in the large hall. To view some pictures please click HERE. Our Lady of Good Counsel Feast Thursday April 25th 6:00 pm in the large hall. New Members Initiation and Pin Presentation. Catered Dinner & Social featuring Chicken Mushroom Alfredo, Spinach & Caesar Salad, Garlic Bread & Assorted Dessert Squares. Tickets are $25.00 per person and available at the parish office and after Mass. Start your spring cleaning! We are looking for donations of good, clean items in good working order, including furniture, appliances, household items, garden supplies, sports equipment, books and miscellaneous. Please note there will be no drop off between 12 pm and 3 pm out of respect for a funeral in progress. Please join us on Sunday April 28th at the 9:00 am Mass as seven of our students celebrate their First Communion and Confirmation. Bishop Gary Gordon will be here to celebrate Mass. Please keep our candidates in your prayers. 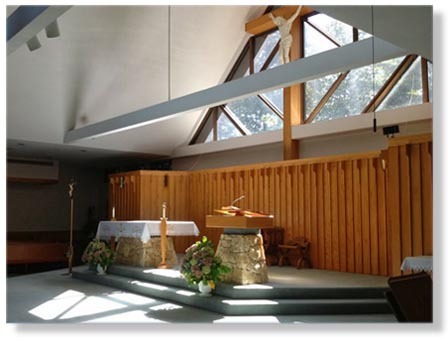 ADORATION OF THE BLESSED SACRAMENT: Takes place every Wednesday following 9:00 am Mass until 10:00 pm. Why not come out and spend a quiet hour with the Lord? Devotional reading material is provided for your use at the back of the Church.